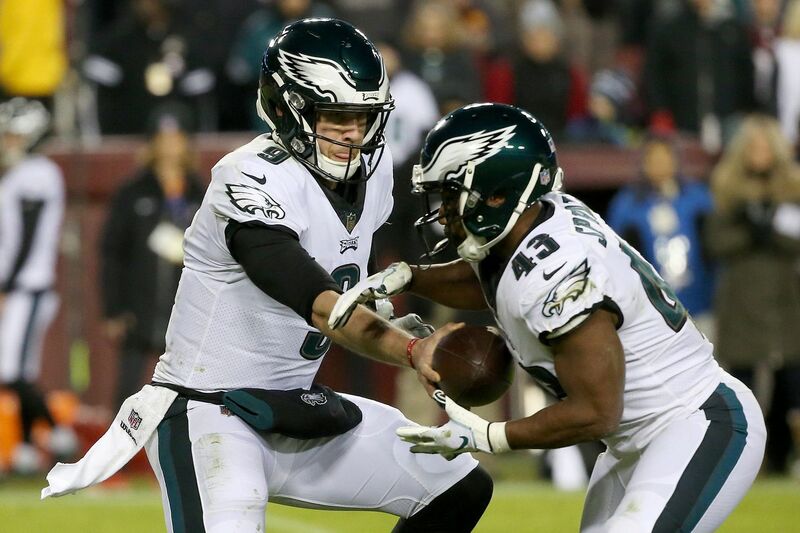 Darren Sproles takes the ball from Nick Foles in the Eagles' regular-season finale. Sproles has been every bit as important as Foles in the late-season stretch. If you’re of the belief that it was Nick Foles who injected life into the Eagles when they appeared left for dead, don’t miss the player often standing next to him. While the Eagles stagnated during the middle of the season, they kept waiting for Darren Sproles to return. Sproles’ hamstring injury lingered, a setback postponed his return date, and by the time he rejoined the lineup on Dec. 3, the Eagles were 5-6 with little margin for error. In came Sproles, who rushed for a touchdown to help lead the Eagles to a win. He hasn’t slowed down since. The Eagles have more losses than they expected this season, but they tend to win when Sproles plays. The team is 5-1 in Sproles’ six games, during which he has averaged 7.3 touches for 46.7 yards, while reaching the end zone three times, and they can even use more. (Sproles was seen after a big game against the Texans two weeks ago colorfully imploring Pederson to keep feeding him the ball.) He also returns punts. On Sunday, Sproles will be the Eagles’ top running back against the Chicago Bears in his first postseason game since coming to Philadelphia in 2014. To keep it from being his last, Sproles will need to continue producing, and the defense will need to stop a player often compared to Sproles: Tarik Cohen, who seems like a Sproles 2.0. Tarik Cohen celebrates a touchdown during the Bears' win over the Vikings in the final week of the regular season. Cohen is a player who has the Eagles’ attention this week. It can be simplistic to compare every undersized running back to Sproles, but the 5-foot-6, 181-pound Cohen’s stature and versatility are comparable to the 5-foot-6, 190-pound Sproles — with more production. He averages 10.6 touches and 73.1 yards per game and has scored eight touchdowns this season. Cohen’s 71 receptions leads the Bears. And he was selected to the Pro Bowl as a return specialist. Cohen could be a difference-maker on Sunday. Eagles defensive coordinator Jim Schwartz said the Bears use Cohen "all over the place”: lined up in the backfield, as a wide receiver, motioning into the backfield, in jet sweeps, inside runs, outside runs, deep passes, and short passes. It’s even more varied than how the Eagles use Sproles. The Bears mostly use two running backs — Cohen has played 46 percent of the snaps, while Jordan Howard, their top rusher, has played 58 percent of the snaps. With the Eagles, Sproles is part of a running-back committee. That was the case at the beginning of the season when Jay Ajayi and Corey Clement were healthy, and it’s still the case with Wendell Smallwood and Josh Adams. In Sunday’s win over Washington, Sproles played 38 percent of the offensive snaps, while Smallwood took 37 percent and Adams had 25 percent. The Eagles haven’t had a running back take at least 50 percent of the snaps since Adams did it on Dec. 3 against the Redskins. Darren Sproles had a big game when he finally returned to the field against the Redskins on Dec. 3. Still, it’s Sproles who has led the Eagles' running backs in snaps in the last two games, and the Eagles will likely ride him. At this point, Sproles is their best running back. He can pick up yards in chunks on the ground, he’s a threat as a receiver out of the backfield, and he’s their best pass blocker. Although the hamstring injury slowed him, he’s returning to the form that the Eagles expected when they brought him back this season following a torn ACL. It’s going to be a challenge for the Eagles to run against the Bears, who are No. 1 in the NFL this season against the run, limiting opponents to 80 yards per game. But that’s what makes Sproles so effective. The Eagles can use him differently than a traditional running back, and when he finds space, he’s dangerous. Sproles is vulnerable to being stuffed at the line, but nearly 14 percent of his rushes go for more than 10 yards, and 20 percent of his catches go for more than 20 yards. He has moved the chains on 31.5 percent of his touches. Considering he entered the season saying he would retire, there’s speculation with each week that he could be playing his final game in the NFL. Pederson has said he would welcome Sproles back next season, but that’s a discussion for a different day. The goal now is to stretch the season at least another game. Sproles is a big reason they even reached the point that it’s possible.